Scuderia Ferrari Mission Winnow ensured that red was the dominant colour of the opening day of the FORMULA 1 GULF AIR BAHRAIN GRAND PRIX 2019, as its cars were fastest in both sessions. 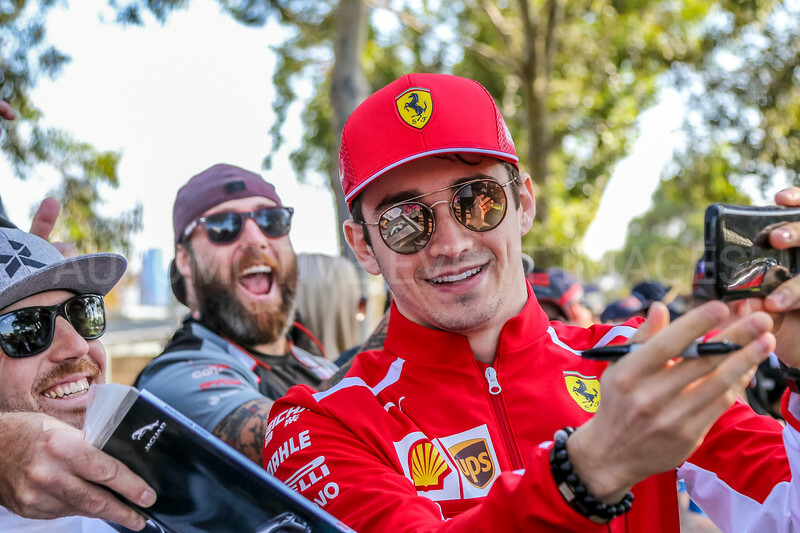 Charles Leclerc led home team-mate Sebastian Vettel in the first session, with the two drivers swapping places in the second. The German set the fastest time of the day in the floodlit period, with a time of 1.28.846, just 35 thousandths quicker than his Monegasque colleague. In contrast to normal practice, both Ferrari drivers used two sets of new Soft tyres in FP2, which meant the team would have more data relative to running the tyres in the dropping track temperatures seen during the night time session. Ferrari had a clear advantage today, with a considerable gap to the third placed driver in both sessions. Valtteri Bottas (Mercedes AMG Petronas Motorsport) was 973 thousandths down in FP1 and team- mate Lewis Hamilton lagged behind by 603 thousandths in FP2. Ferrari was also centre stage in the paddock today, with one of the Prancing Horse’s most iconic road cars, the F40. The last car to be signed off by Enzo Ferrari was dedicated to the company’s 40th anniversary and was centre stage today at the announcement of a new partnership between Formula 1 and RM Sotheby’s, the fruits of which will first be seen at the FORMULA 1 ETIHAD AIRWAYS ABU DHABI GRAND PRIX 2019. The Yas Marina circuit will host the first auction of classic and sports cars in the Middle East. The sale will focus on bringing together an expertly curated selection of significant Grand Prix racing single- seaters and road-going sports cars with an historical connection to the world of motorsport, alongside a broader collection of hand-picked, blue-chip classic and supercars. If the first two rows of the Friday “grid” went to the usual suspects, the rest of the order was a bit more varied than usual. Nico Hulkenberg (Renault F1 Team) was fifth in 1.29.669, just 56 thousandths quicker than Max Verstappen (Aston Martin Red Bull Racing.) No either driver got under the 1m 30s barrier, with a group of 12 drivers, from Kevin Magnussen who did a 1’30 dead in the Rich Energy Haas F1 Team car, to the 1.31.144 of Antonio Giovinazzi (Alfa Romeo Racing) all lapping within just over the same second. Trailing a way behind this dozen were the two ROKiT Williams Racing cars of George Russell and Robert Kubica, once again in Bahrain confirming that the team is struggling in this very early part of the season. A fortnight ago in Australia, the signs from Friday were that Mercedes was dominant, while Ferrari struggled and dropped behind the Red Bulls in terms of pure performance, with the rest of the field all closely grouped together. However, Friday at the FORMULA 1 GULF AIR BAHRAIN GRAND PRIX 2019 would seem to follow the outcome of the two pre-season tests in Barcelona, where Ferrari shone. To know more, one will have to wait for the next instalment of this fascinating FIA Formula 1 World Championship, starting with tomorrow’s qualifying session. The Bahrain weekend also sees the start of the FIA Formula 2 Championship. There’s already a series leader as Luca Ghiotto picked up the four points that go with being fastest in qualifying, thanks to a best lap of 1.40.504. The Italian, who drives for the UNI-Virtuosi team was 367 thousandths faster than Switzerland’s Louis Deletraz (Carlin) and 385 thousandths quicker than Dutchman Nyck de Vries (ART Grand Prix,) while Canada’s Nicholas Latifi rounded off the front two rows of the grid for tomorrow’s Feature Race. There was plenty of interest in one of the rookies in the series: Mick Schumacher, driving for PREMA Racing, was tenth fastest in 1.41.583. Formula One Press Office 29 March 2019.